BRAND NEW! An industry luxury exclusive! BLACK BROWN LASHES! - 0.03 thickness - ideal for Mega Volume extensions with sets up to 23D! 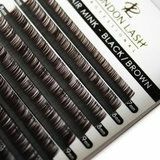 Need advice about 0,03 Mixed Size Black Brown Mayfair Mink Lashes C/CC/D?